MMA Flooring system installed in a factory. Our MMA floors feature superior durability and faster curing times and options for ESD systems. For a consultation or estimate, contact us. MMA flooring systems and coatings feature UV protection, high chemical resistance and super fast curing times. MMA Floors have the fastest dry times of all resinous flooring systems. The curing times our as quick as one hour per coat. MMA Floors may also be installed at below freezing temperatures, as low as 0°F. Our MMA systems feature superior resistance to acids and alkali. Plus they are UV stable and cure to an attractive, low-glare satin finish. 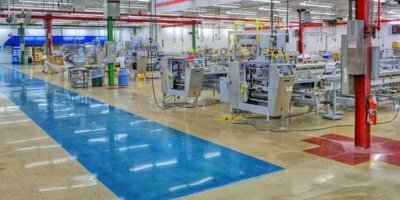 A variety of MMA flooring colors and design options are available, including ESD systems for electronic industries. We've applied Epoxy, MMA and Urethane floor coating systems for the following facilities and more. Contact us for the best combination and system for your MMA Flooring application. Make sure you meet and exceed your usage and industry's requirements. With informed and high standards, We can help you with that. We're certified and qualified epoxy and MMA floor coating contractor for all major brands, including Dur-A-Flex, BASF Chemicals, Key Resin Company and more. We often work with Cryl-A-Flex, Dur-A-Flex's family of 100% reactive MMA Floor systems.